Describing it as a “popular Chinese daily newspaper,” Xinhua has announced that the Global Times is now available in the US, in both English and Chinese. The Global Times said the U.S. edition would provide readers with sharp reporting and perceptive analysis. It seeks to cover world events from a Chinese perspective, and introduce a dynamic, complex and changing China to the world in vivid, accurate reporting. The English version apparently runs at 24 pages, while the Chinese version is 16. GT has a circulation of more than 2 million in China. The more you know. As China now stands under the glare of the global spotlight, the newspaper aims to showcase for a global audience real voices from across a transforming China, guiding it through China’s fast-growing economy and ever-changing society, the newspaper said Friday in a briefing. The article doesn’t say which cities the paper is available in. I actually saw a China Daily in New York being sold next to prominent subway stations. 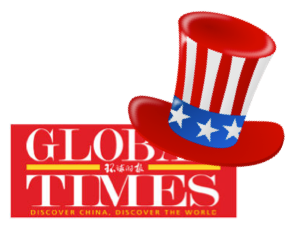 Those of you in America: if you see a Global Times anywhere, please, let us know.